One of the stories of the 42. DMV 4-Stunden-Rennen was Land Motorsport’s rise and fall. Connor De Phillippi did everything right in the opening hours of the second VLN race of the season. 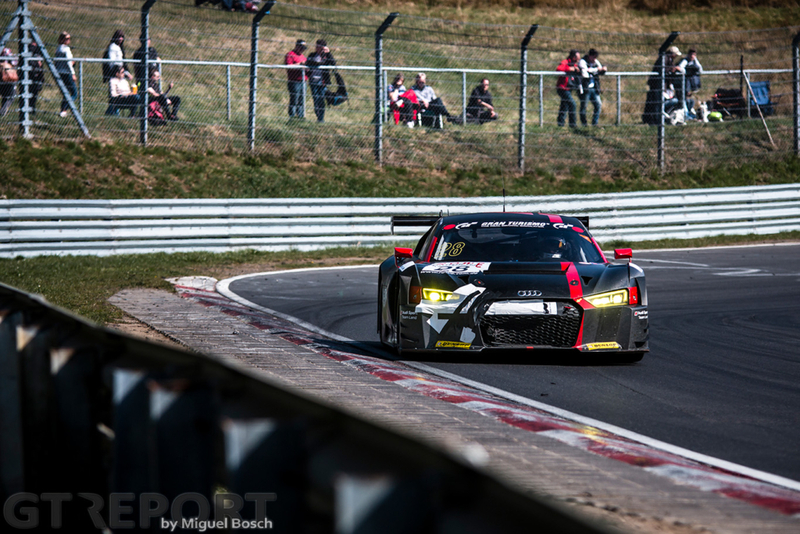 Having started from 21st on the grid after a little set-back in qualifying, the American drove the Land Motorsport Audi R8 LMS GT3 all the way up to seventh place before handing over the steering wheel to Christopher Mies. Just when victory in VLN2 looked inevitable, Mies suddenly lost speed in the final kilometers, dashing a near-certain win. After getting stuck in traffic during qualifying, the Audi had to line up 21st on the grid. From deep within the 30-plus GT3 field, De Phillippi started the push to the front. Christopher Mies continued the climb in the final two hours, setting a blistering pace and taking no prisoners on his way to taking the lead on the last lap. Part of the preparation for the 24 Hours of the Nürburgring during this race was choosing which tyre to chose. The team decided to go with the Dunlops for the weekend, a brand this season praised by those who have driven on them. De Phillippi found out during the race why. Having served mainly as a try-out for the 24 Hours of the Nürburgring that will take place next month, De Phillippi isn’t distraught by how the race unfolded. “In general, we’re all happy. Obviously we’re still a bit frustrated with how it ended the way it did, but we’re all happy with the performance and the speed shows that we’re able to fight for the win, which is always an encouraging feeling.